Recently I have been thinking about ways to work to help the retailers get more people in their store. It’s not an easy thing to do. So, then I thought about making it simpler … how to just help retailers (with the big focus on those that are Main Street members). I came up with a couple of solutions. First, get people to quit thinking that the business owners need to pay for everything their group wants to do. Rather than the XYZ club asking for donations to attend some special camp, they need to do fund raisers to gain the money. Why is it the business owner’s responsibility to send them to camp? Specifically fund raisers need to have the people needing the funds do the work, not someone else. Honestly, during annual ad selling time, a Guymon retailer can get 10 requests in a day for money or donations. Generally these don’t help sell the retailers product, either. Second idea is to get those who do receive support from local businesses to support them in return. If the local grocery store supports your school with annual ads, program ads, sports sponsorships, FFA purchases, or more … then the school groups should buy from that local grocery store. Is it cheaper to drive 100+ miles and save $20 but not get financial support in the future? It all needs to be considered. 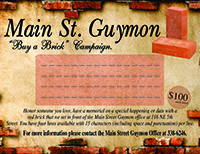 If Main Street Guymon purchases their building insurance from someone other than a member, shame on them (and we don’t, I promise). My favorite story was from Alphonso Mata who worked at a car dealership. When being asked for a donation, he asked the person requesting where they bought their car. It had been purchased out of town. Mata then told them that he would match whatever that car dealership gave. They didn’t come back. Puts it in perspective, doesn’t it? Be good to your neighbor. Support them in the same way that you would like to be supported. It makes for a much healthier community. True community support makes me think about PTCI crews and Guymon Lions Club members helping city employees (parks and fire department) clean up dead trees in the parks. Who wins? We all do because our public park is better. So if you have a chance, thank PTCI and Lions Club for helping. Thank the city folks for being good stewards of the parks. And thank the Bank of the Panhandle and PTCI for feeding the crews. They all deserve an ATTA BOY. Charles Michael from the Guymon Community Theatre recently sent an email out to his board and volunteers. There were lots of ATTA BOYs in the email. He talked about Jerry Wadley painting and cleaning up at the theater. He commented on Josh Setzer, Lisa Schmitt, and Deirdre Harbison working on advertising. He thanked Tony Hardman for writing the Oklahoma Arts Council grant application. And the treasurer Darrell Hill was mentioned for doing such a great job. This is just one example of the wonderful community we live in … the fabulous volunteers working together to get good things done. Thank you to all of you that unselfishly give of your time and money to the community groups, schools, and churches. Thank you to all those businesses that are kind enough to help. You all give value to life. You are good friends. I bet you’re good friends, too. Make it a point to give value this week. Give thanks. Smile. I will joyfully see you on the bricks!